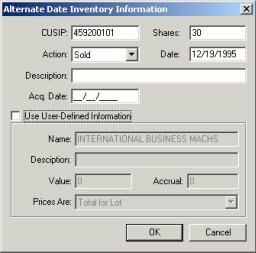 When you adjust an inventory in EstateVal, you are showing changes to your portfolio between two dates. 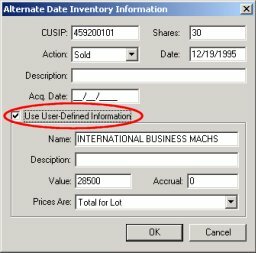 For instance, when you adjust the inventory for the Alternate Date Report, you are telling EstateVal that on the date-of-death you held X units and -- six months later on the alternate date -- you now hold Y units. Y can actually be up to twenty unique entries: more shares of the same CUSIP if there was a split or a shares-dividend, or less of the same CUSIP if you sold some off; it can be a list of new CUSIPs, if there was a spin-off or merger. A lot can happen to a security in the six months between the date-of-death and the alternate date, and entering them into EstateVal correctly will assure that your reports are calculated right. 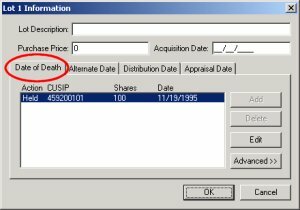 Here's an example: Let's say you have 100 shares of the CUSIP 45920010 (IBM) on the date-of-death, November 19, 1995, as in Figure 1. Now say you sold 30 of these shares a month after the date of death. How can you tell EstateVal about this sale? To start, select the security you just entered and click on the Adjust Inventory button. Figure 2 will appear. 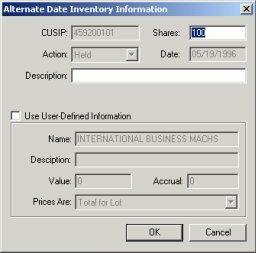 Now, since adjusted inventories are for changing portfolio holdings between the date-of-death and other dates, you cannot do anything from this dialog while the Date of Death tab is selected -- the main screen is where you enter the date-of-death inventory. But click on the Alternate Date tab and things change a little, as in Figure 3, on the next page. For one thing, the single line in the box has changed slightly. On the date-of-death, it told you that you held 100 shares of 45920010 on November 19, 1995. Now, with the Alternate Date tab selected, it's telling you that you still hold that same 100 shares six months later, on the alternate date. But since you really only hold 70 shares on the alternate date -- you sold off a group of 30 shares, remember? -- this needs to be changed. Click the Edit button and Figure 4 will appear. From here, you can tell EstateVal how many shares you held on the alternate date, which, in this case, is 70. Enter that into the Shares: field and click OK. If you flip back and forth between the Date of Death and Alternate Date tabs now, you'll see that on the date-of-death, EstateVal thinks that you held 100 shares, but on the alternate date, you only held 70. You now have to account for the 30 shares you sold. From the Alternate Date tab, click Add. This will let you add a new entry to the alternate date's inventory. 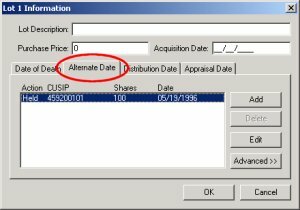 Change Shares: to 30, Action: to Sold and Date: to the date of the sale -- December 19, 1995 in this example. Your screen should look like Figure 5. And that's it! 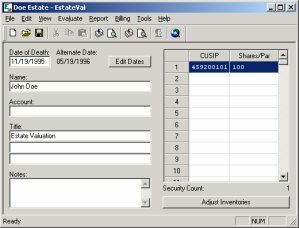 If you were to do an alternate date evaluation on this estate now -- just as a warning: if you do, you will be billed -- the final result would show accruals for 100 shares of 45920010 on the date-of- death, the sale price for 30 shares a month later, and the value of the remaining 70 shares on the alternate date.